Spread some Earth Balance liberally into a 9 x 13 inch oven-proof baking dish. Reserve the rest for layering the gratin. Cut the peeled butternut squash in half, crosswise, where it just begins to round. Slice that section thinly with a mandoline, or in your food processor. Cut the seeded section in half, lengthwise, and slice. Keep the seeded lengthwise slices separate, they will go on the bottom layers. Use all of your round pretty slices for the final top layer. Combine all the spices, xylitol, and kosher salt in a small bowl. Set aside. Put a thick even layer of the squash bottom slices in the baking dish. Add 2-3 cut teaspoons of Earth Balance across the squash. Note: I did a two-slice layer of the slices for each layer. Add a few cut up teaspoons of Earth Balance between layers. Then a thick layer of the sliced onions. This recipe came about due to a great sale on butternut squash at my local market. I feel with a family of six stocking up is a safe bet! I thought what better way to showcase this sweet, flavorful vegetable than to layer it in a gratin type dish. I took notes as I went along on this new out-of-the-blue recipe, and am SO glad I did, it was a winner! 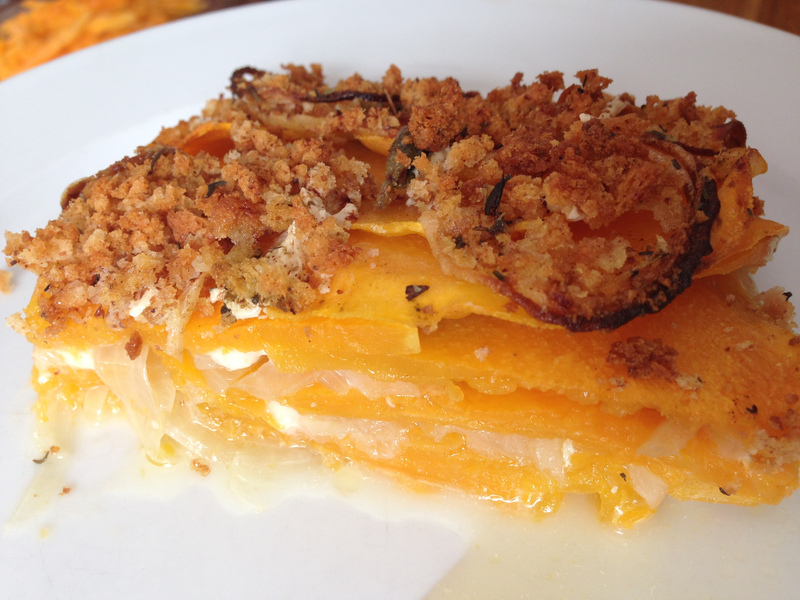 The butternut squash layered with the sweet onion, oozing vegan cheese was just perfect with that hint of savory from the sage, and crunch from the breadcrumbs on top. You will be surprised how filling this dish is. This makes from an amazing Meatless Monday meal or even brunch that is sure to impress!